^ Kurtzman CP, Piškur J (2006). "Taxonomy and phylogenetic diversity among the yeasts". In Sunnerhagen P, Piskur J. Comparative Genomics: Using Fungi as Models. Berlin: Springer. pp. 29–46. ISBN 978-3-540-31480-6. ^ Kurtzman CP, Fell JW (2005). in: The Yeast Handbook, Gábor P, de la Rosa CL, eds. 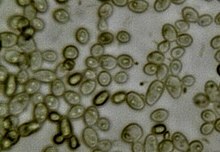 Biodiversity and Ecophysiology of Yeasts. Berlin: Springer. pp. 11–30. ISBN 978-3-540-26100-1. ^ a b c Zaky, Abdelrahman Saleh; Tucker, Gregory A.; Daw, Zakaria Yehia; Du, Chenyu (September 2014). 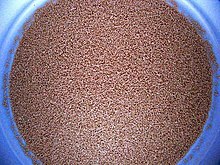 "Marine yeast isolation and industrial application". FEMS Yeast Research. 14 (6): 813–825. doi:10.1111/1567-1364.12158. PMC 4262001. PMID 24738708. This article contains quotations from this source, which is available under a Creative Commons Attribution license. ^ Bernstein H, Bernstein C (2013). "Evolutionary Origin and Adaptive Function of Meiosis". 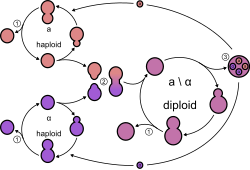 In Bernstein C, Bernstein H. Meiosis. ISBN 978-953-51-1197-9. Retrieved 29 May 2016. ^ Birdsell JA, Wills C (2003). MacIntyre RJ, Clegg MT, eds. The evolutionary origin and maintenance of sexual recombination: A review of contemporary models. Evolutionary Biology Series >> Evolutionary Biology. 33. Springer. pp. 27–137. ISBN 978-0306472619. ^ For more on the taxonomical differences, see Dowhanick TM (1999). 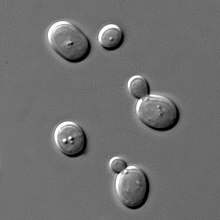 "Yeast – Strains and Handling Techniques". In McCabe JT. The Practical Brewer. Master Brewers Association of the Americas. ^ Tong AHY, Boone C (2006). "Synthetic genetic array analysis in Saccharomyces cerevisiae". In Xiao W. Yeast Protocols. Springer Science & Business Media. pp. 171–191. ISBN 978-1-59259-958-5. ^ Ishiwata S, Kuno T, Takada H, Koike A, Sugiura R (2007). "Molecular genetic approach to identify inhibitors of signal transduction pathways". In Conn PM. Sourcebook of Models for Biomedical Research. Springer Science & Business Media. pp. 439–444. ISBN 978-1-58829-933-8. ^ Lin Z, Li W-H (2014). "Comparative genomics and evolutionary genetics of yeast carbon metabolism". In Piskur J, Compagno C. Molecular Mechanisms in Yeast Carbon Metabolism. Springer. p. 98. ISBN 978-3-642-55013-3. ^ Hurley R, de Louvois J, Mulhall A (1987). "Yeast as human and animal pathogens". In Rose AH, Harrison JS. The Yeasts. Volume 1: Biology of Yeasts (2nd ed.). New York, New York: Academic Press. pp. 207–281. ^ a b Kurtzman CP (2006). "Detection, identification and enumeration methods for spoilage yeasts". In Blackburn CDW. Food spoilage microorganisms. Cambridge, England: Woodhead Publishing. pp. 28–54. ISBN 978-1-85573-966-6. ^ Fleet GH, Praphailong W (2001). "Yeasts". In Moir CJ. Spoilage of Processed Foods: Causes and Diagnosis. Food Microbiology Group of the Australian Institute of Food Science and Technology (AIFST). pp. 383–397. ISBN 978-0-9578907-0-1. This page was last edited on 16 April 2019, at 18:07 (UTC).